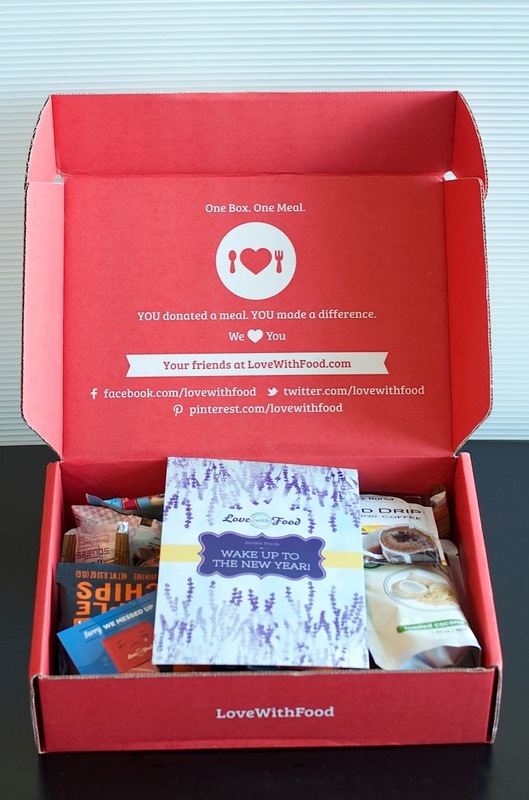 My first Love with Food box arrived yesterday! 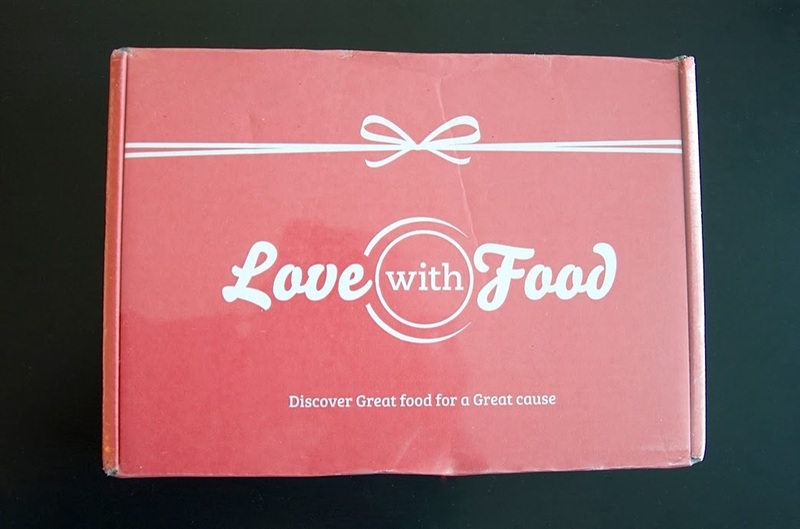 If you're not familiar, Love with Food ships out a tasting box filled with natural or organic snacks every month, and also donates a meal to a food bank or other charitable organization for each box sold. 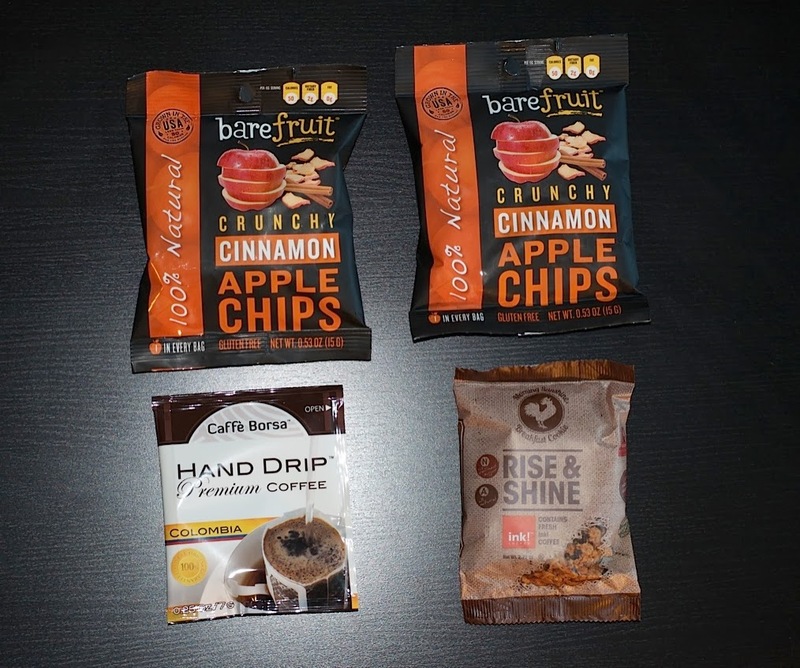 You really can't feel guilty about treating yourself to these healthy snacks, because you're simultaneously providing a service to your community (in case you needed some justification -- I'm here for you!). Check out that bountiful bonanza of snacky goodness! The box was overflowing! 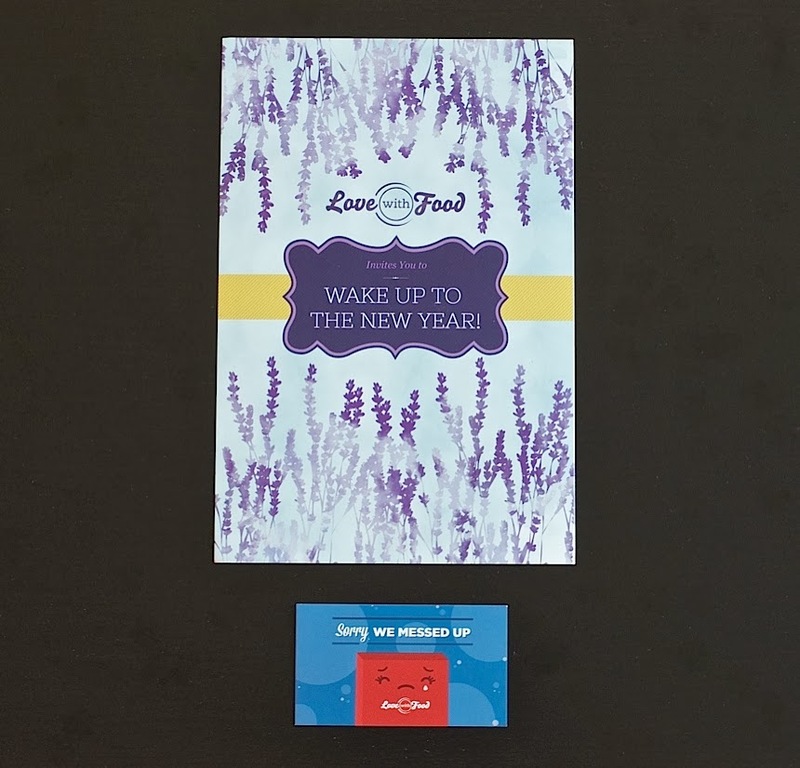 January's theme is "Wake Up to the New Year!" so a few --though not necessarily all, from what I could tell-- of the selections were breakfast-oriented. I thought it was considerate of LwF to acknowledge the omission -- I always appreciate that kind of thoughtfulness. More about the subbed items as we go along. Now on to the contents! Jer's Squares, Original and Pretzo Change-O. There were actually four squares in the box, two of each: but I ate the second Pretzo Change-O before we noticed! Oops. I can report, though, that it was deeeelicious, like a rich peanut butter cup mixed with ground-up pretzel. Mmm mm! Lovely Candy Co. Super Fruit Chews. I haven't tried these yet, but they kind of look like taffy squares (like Now and Laters). Annie's Organic Berry Berry Chewy Granola Bar. 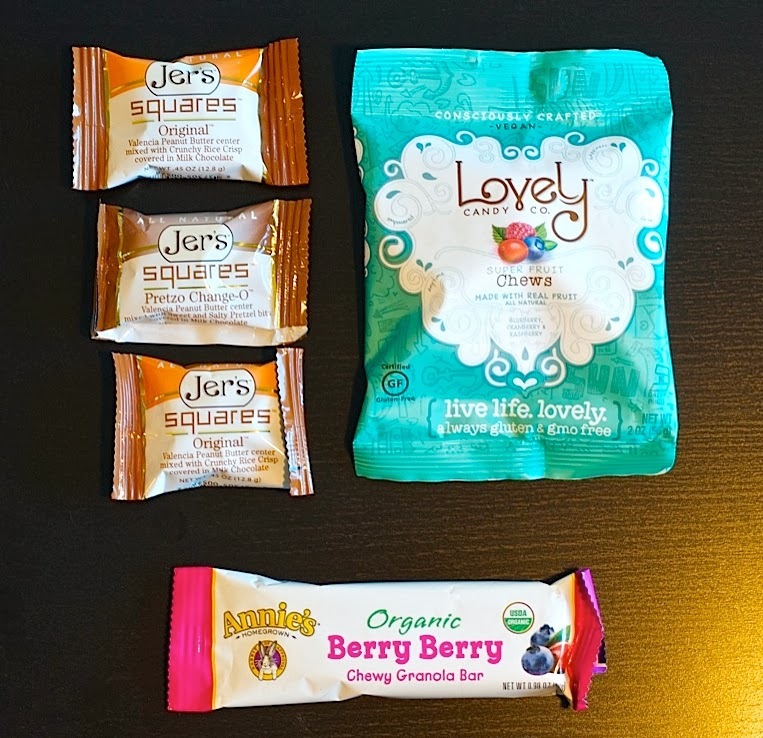 Perfect work snack: granola bars are always welcome. Home Free Mini Chocolate Chip Cookies. Possibly a better-for you version of the old Famous Amos standby? 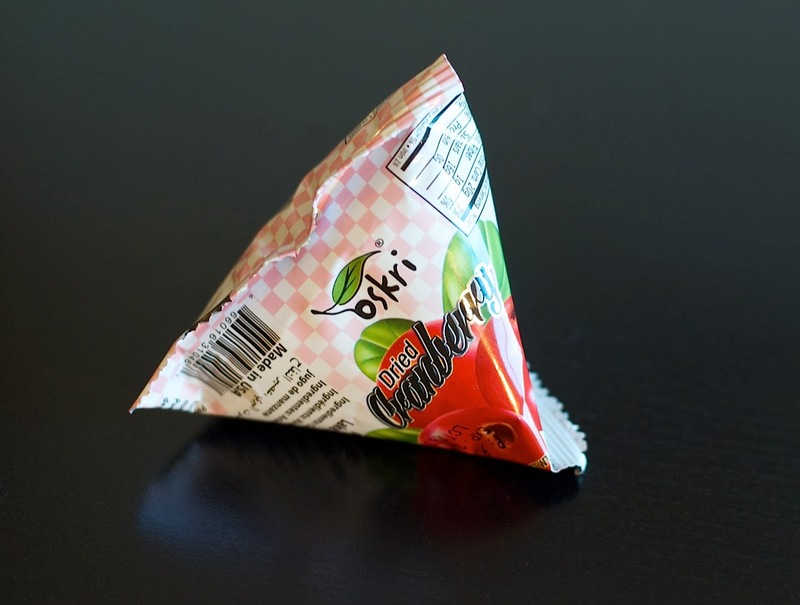 Oskri Orange Fruit Bars. I just realized I've never had an orange-based fruit or granola bar -- how odd. I love oranges and orange marmalade, so I'm psyched to try these. Plus they're low-cal, which doesn't hurt. Blue Diamond Lightly Salted Almonds. Maybe the least exciting item in this otherwise-excellent box. I'm not a big fan of almonds, but hey, they're healthy and we'll find a use for them yet. Bare Fruit Crunchy Cinnamon Apple Chips. 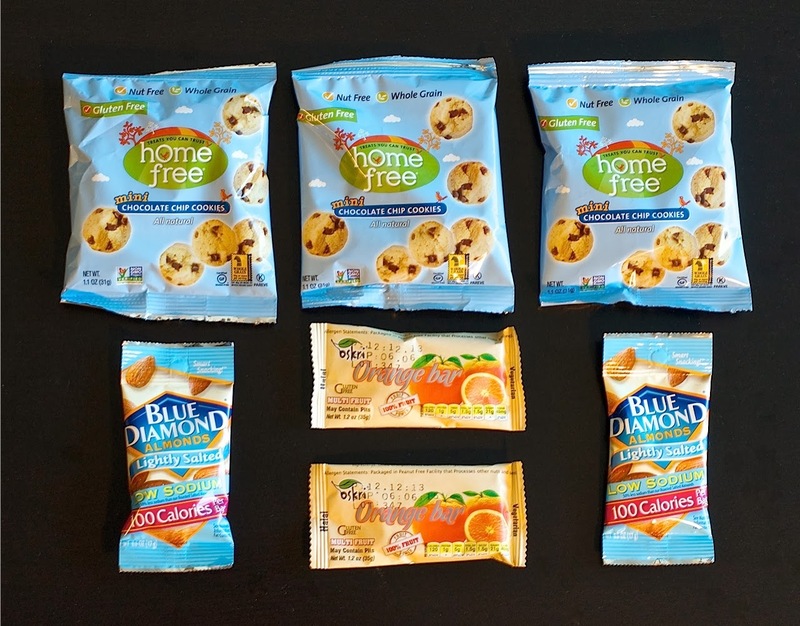 This was one of the two replacement items I received instead of the Mama's Magic Mix Banana Split trail mix and the Hi I'm Skinny Sea Salt Skinny Sticks -- and honestly, I couldn't be happier! I love apple chips, so this was a gain for me. Woo! Caffè Borsa Hand Drip Premium Coffee, Colombia. 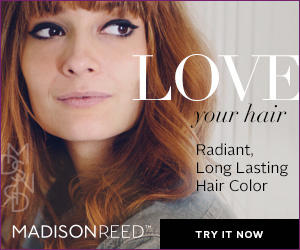 At first glance, was super disappointed when I saw this, assuming it was a bag of instant coffee. Once again, that just goes to show what good assuming does (not much). Turns out this operates on a similar principle as pour-over coffee, which is purported to be one of the best brewing methods by coffee snobs everywhere: in this case, you take the little coffee bag/filter out of the package, put it in a mug, and slowly pour hot water over the ground beans so the coffee drains into the mug. I'm a French press semi-snob myself, so I'm totally down to try this convenient yet old-school little treat. This was such a cool surprise! Lisa Harris Pantry Rise and Shine Morning Sunshine Cookie. Cookie for breakfast? And it's good for me? And it's made with coffee?! Um, yes please! I'll have to report back on these stat. Oskri Dried Cranberries. This little guy had such oddly-shaped packaging, he was a mission to photograph. But here he is! You really can't go wrong with dried cranberries. These'll be added to a salad or possibly tossed in with those pesky almonds for a snack. 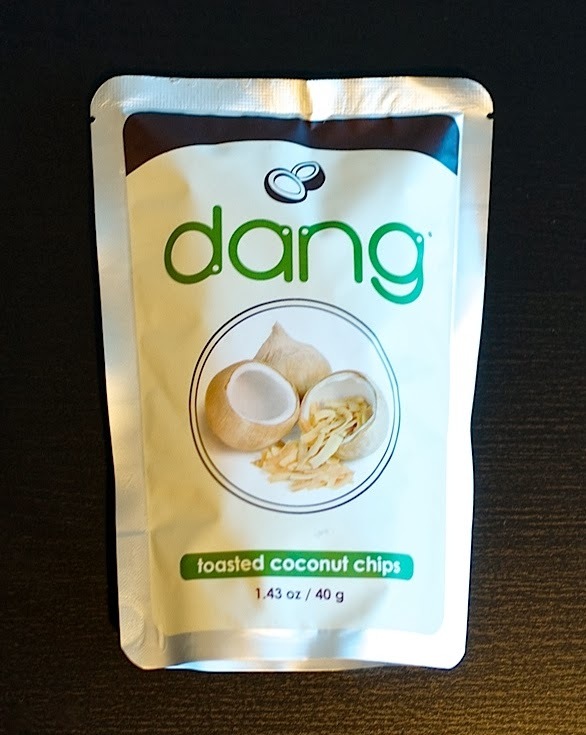 Dang Toasted Coconut Chips. This was the second replacement item in my box. I'd actually received these in another food box a while ago, either Goodies.co or Foodzie (RIP), and really liked them. They're awesome thrown into salads or on top of chocolate ice cream. Another win! I have to say, I loved my substitutions. And that's it! Whew! As you can see, the Deluxe Box is serious: these snacks should last me through a good month of take-along work pick-me-ups. Remember, if going Deluxe is too much for you, you can scale back and subscribe to the Taster's Box instead. 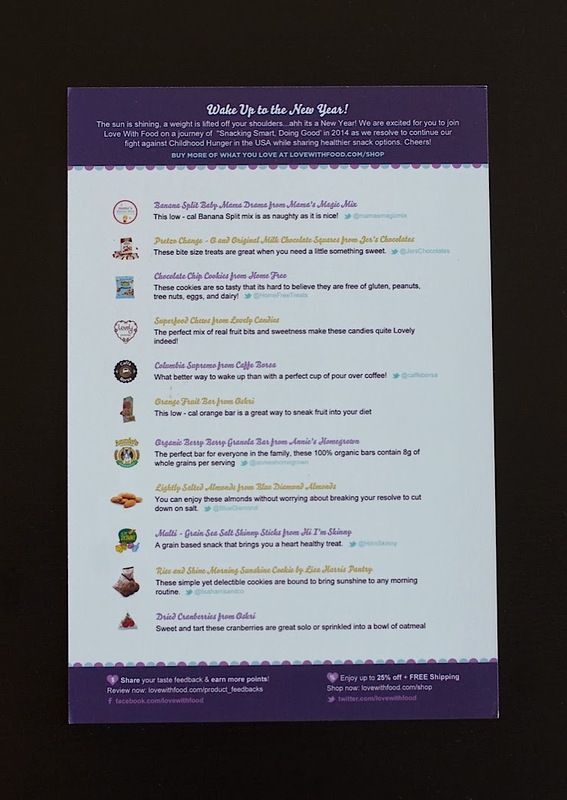 If you're interested in learning more about Love with Food or know you want to sign up, you can use any of the Love with Food links scattered through this review, which will earn me some points, and earn you my eternal gratitude. 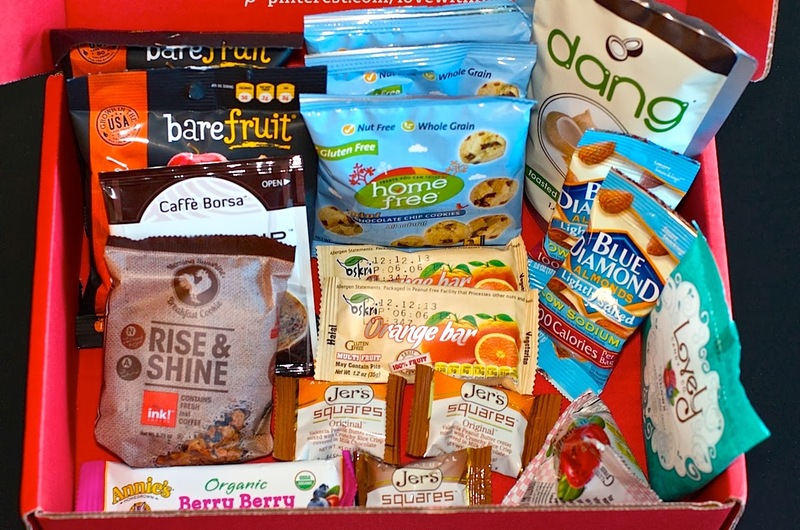 If you decide on the Taster's Box, use coupon code FB7OFF at checkout to get it for just $5. 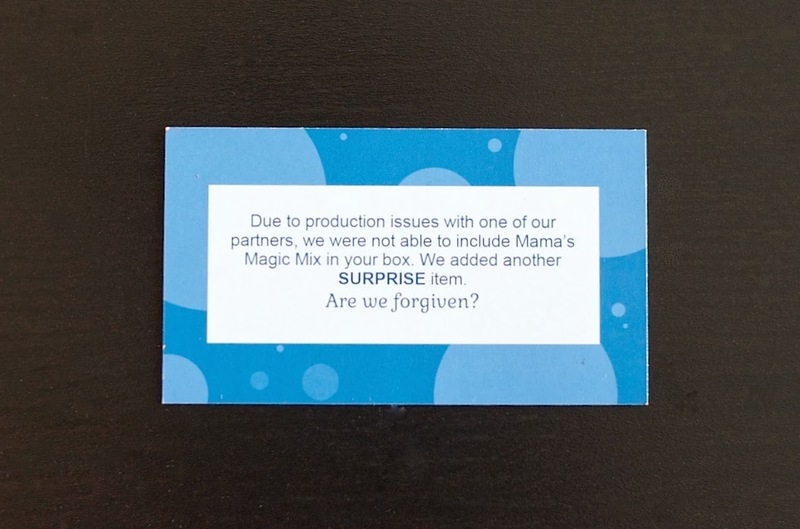 I'm not sure if it'll work on the Deluxe Box, though -- please report back if you try it out! 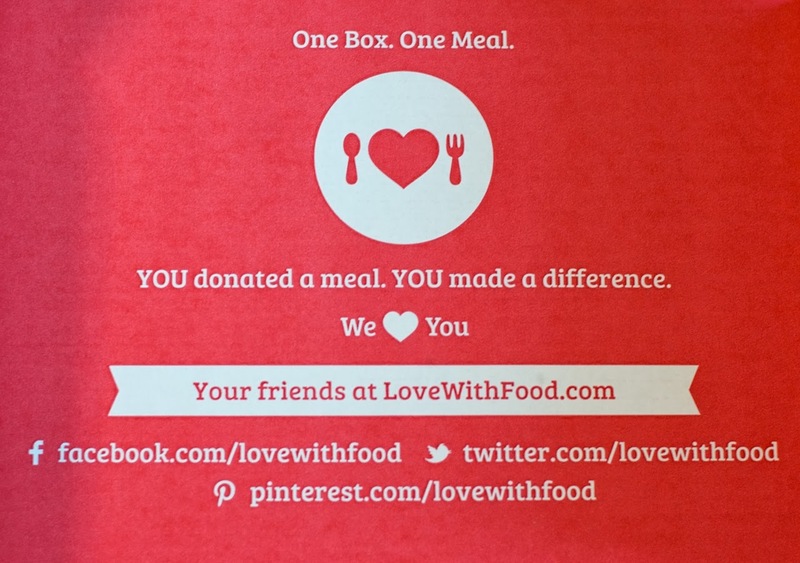 And how did you like the January Love with Food box?